I read a blog the other day, written by a parent, who was responding to a question he heard a lot. Why does he spend so much money for the dance program for his daughters? He then went on to explain that he doesn’t pay for dance at all. What he is paying for are all of the benefits his daughters receive by participating in the dance program. It’s not to set them on a path to become professional dancers, although that may be the result. He is investing in helping his children develop life skills. He is paying for the opportunities and experiences they will receive that will help them become great people. That blog made me think about the parents who enroll their children in music lessons. Not every parent who enrolls their child in music lessons expects them to become a professional musician. Some of those children will discover that music is something they love and can’t live without, and they will decide they want a career in music. But most of them will pursue other careers. Although they still enjoy playing music, they may have another calling. So was all the time and money spent on kids' music lessons wasted? Not at all. When parents enroll their children in music lessons, many of them are doing it because they have heard, or maybe even experienced for themselves, that learning to play an instrument is good for you. They are right, but what benefits are there to music lessons, aside from learning to play an instrument or sing? Learning to play an instrument requires concentration, focus and determination. These are not skills that kids are born with. They have to be learned, little by little, as they go through life. But learning to play is also fun, which makes this a good way to develop these important skills that will help them in school and beyond. Learning to play their first song gives kids a sense of pride. It makes them confident they can learn more songs. The feeling of accomplishment, as they overcome each obstacle, gives them the confidence to tackle even bigger challenges. Music is a social experience. Playing music with others and for others, requires kids to develop skills such as communication, teamwork, and conflict resolution. They will learn to be open to others’ viewpoints and realize that they can learn from others. Through playing and learning to write their own music, students learn a new way to express their feelings and thoughts. Especially as they become teenagers, learning good ways to explore and share feelings is important. Playing music is a great way to relieve stress. When concentrating on playing, there isn’t room for other worrisome thoughts. Music can also be a source of pure happiness and joy. Learning to play an instrument gives students more than the skills needed to play music. It gives them the added bonus of learning many life skills in a fun and fulfilling way.They also get the opportunities and experiences that will help them become great people. 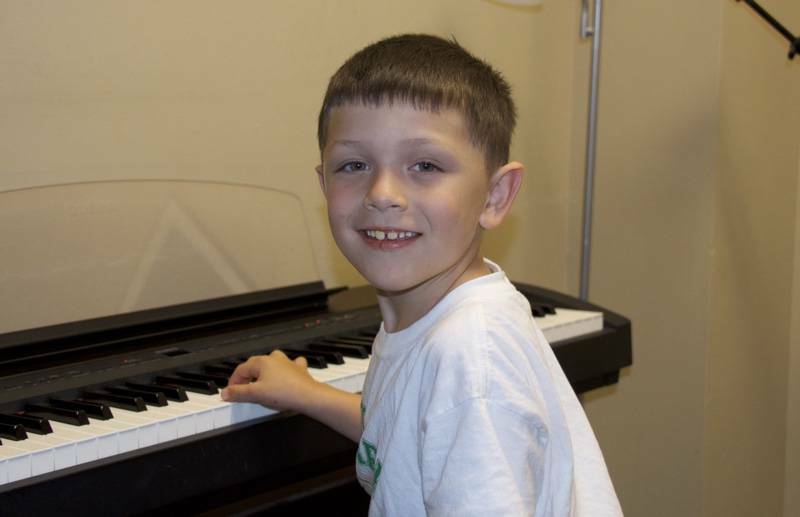 Want to find out more about kids music lessons in Overland Park and Lenexa?